Each Jehovah's Witness you will talk to has a bottom line that proves him right and you wrong. No matter how good your arguments -- on the Trinity, salvation, hell or whatever subject you have chosen to dialogue -- the fact that he's at your door, and you're not at his, when all is said and done decides whether he's the Christian or you are. That is the bottom line  whatever subject you discuss, however much time you give him  he and his fellow Jehovah's Witnesses (and ONLY Jehovah's Witnesses) are Christians because: 1/ they and they ONLY use the true name of God, Jehovah; 2/ they and they ONLY know the truth about the kingdom of God, which, they will assert, was the emphasis of Jesus and his apostles; and 3/ they and they ONLY not only know these truths, but preach them door-to-door, again in imitation of Jesus and his earliest followers. Until you strip away these unique 'badges' which the Witness wears, you will probably flail away in futility trying to dislodge one brick at a time from the Watchtower's complex belief system. How much simpler to remove the foundation stones. For the Jehovah's Witnesses, the foundation of his faith is the Watchtower 'organization'  the "faithful and discreet slave class" which he believes is predicted by Jesus in Matthew 24:45-51. But if you attack his 'mother' (for that is how the Watchtower trains him to think of the 'organization'  as the wife of Jehovah) you run the risk of losing his ear. Far better to chip away at the second tier of the foundation, the 3 'badges' listed above which, as far as the Witness is concerned, prove that Jehovah's Witnesses (and 'mother') have "the truth", as Witnesses habitually refer to their religion. We might even reduce the fundamentals of Witness belief to a simple sentence: Jehovah's Witnesses have 'The Truth' because they are the only religion that goes door-to-door. No Witness, of course, will admit that this is the only 'proof' of the true religion. Nevertheless, when you survey the history of the Watchtower you quickly realize this form of evangelism is the constant -- the "mark" which separates Witnesses from other groups espousing similar beliefs. Others challenge the Trinity, others 'turn the hose on hell', many evangelicals and many cultists emphasize the Second Coming  but no other group organizes systematic visitation of every home to spread its beliefs. A Jehovah's Witness, if asked which is the most important of all Bible teachings, will probably answer "the vindication of Jehovah's name" or the "preaching of Jehovah's name and kingdom", or something similar. But the Watchtower did not promote the name "Jehovah" widely till the 1930s (they officially became "Jehovah's Witnesses" in 1931), nor did they publically promote the earthly kingdom that is now their 'good news' until 1935. If, then, the Watchtower did not promote these peculiar beliefs which 'mark' them as "God's people" till over 5 decades into their history, why did God deign to use them at all before that? The Witness conviction is that God saw in them, despite their imperfect understanding, a willingness to 'preach the good news' in the face of opposition. This is why Watchtower literature is so fixated on the years 1914-20  a 7 year period which, to outsiders, is one unbroken, embarrassing sequence of Watchtower false prophecies  but which in modern Watchtower mythology has somehow been turned into the era of their greatest triumph and vindication. God did not cast them off for their fundamentally unsound beliefs (by modern Watchtower standards), or judge them unfaithful because of their perfect prophetic record (100% failure). Rather, according to Witness understanding of Malachi 3, the Lord (Jesus) "came to his temple" suddenly (in 1919) and pronounced the Watchtower leaders as "faithful and discreet", sealing them as his unique 'slave', the only organization he would henceforth recognize and use. What was the basis of the Lord's judgment? Forgotten are The Finished Mystery's date-setting false prophecies and worshipful treatment of "the Laodicean messenger" Charles Taze Russell. What counts to the Watchtower leaders today  and what they obviously think counts to God too  is the Society's "fiery" pronouncements during this period, their "boldly" denouncing Christendom. In summary, what really counts in the Society's view is not the content of these publications  if it did, they would be reprinted today! - but the guts demonstrated in circulating them. The Watchtower Society, finally, is God's modern Elijah and Moses (these quotes from Climax occur in a section tracing the career of the 'two witnesses' of Revelation 11). And God is WITH the modern Elijah and Moses because they 'prophesy' (however inaccurately) against Christendom. It is no coincidence that the scandal of The Finished Mystery was immediately forgotten by Rutherford and his headquarters cohorts. Instead of retreating into the wilderness for some soul-searching and honest self-evaluation  as the real Elijah did after his contest with the Baal prophets - Rutherford and his colleagues just got busier with their publishing projects. Millions Now Living Will Never Die! (1920) replaced The Finished Mystery as the calling card of the Watchtower door-to-door colporteurs. This new campaign, focussing the Bible Students on a new date (1925), was an extremely effective way of moving Russell's followers away from the prior failed dates (1914, 1915, 1918 and 1920). Rutherford's most brilliant move, though, was to mobilize ALL the Bible Students in the new campaign. By 1927, even the failure of the 1925 prediction in Millions hardly caused a blip in the 'Advertise Advertise Advertise' hysteria which now consumed the 'faithful'. Now, however, they were no longer carrying founder Russell's books door-to-door. The seven volumes of Studies in the Scriptures had been replaced by 'new light'  Rutherford's books The Harp of God (1921) Comfort for the Jews (1925) and Deliverance (1926) being the official substitutes. In this way, Rutherford deflected attention away from the failed predictions and interpretations (even his own  The Harp of God had undergone extensive revision by 1928), and switched attention from the message to the method of its delivery. All Bible Students were by now expected to go door-to-door. This was the 'test' by which God now evaluated who was faithful and who was not, who was Christian and who was hypocrite. Of course, historical retrospect allows us to see that in reality it was Rutherford's test, not God's. By 1931, the Watchtower's second president had determined who really was the 'faithful and discreet slave'  and it wasn't any longer C.T. Russell! 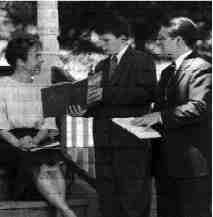 When, in that year, Rutherford renamed the Bible Students Jehovah's witnesses (with a small "w"  Russell had insisted that 'denominational' names were of the Devil) cynics could be heard to remark on the TRUE significance of the J in JW: all the books, booklets and phonograph records which 'witnesses' now carried with them house to house were creations of one man  Joseph F. Rutherford. The 'faithful' ones were definitely no longer Russellites, as the public had always called them, but were now Joe's witnesses.